Lithium-air battery; electricity from shifting light; piezoelectric textile. Researchers at the University of Illinois at Chicago and Argonne National Laboratory designed a new lithium-air battery that works in a natural air environment and still functioned after 750 charge/discharge cycles, a record for this battery type. In theory, lithium-air batteries work by combining lithium present in the anode with oxygen from the air to produce lithium peroxide on the cathode during the discharge phase. The lithium peroxide would be broken back down into its lithium and oxygen components during the charge phase. However, experimental designs of such lithium-air batteries have been unable to operate in a true natural-air environment due to the oxidation of the lithium anode and production of undesirable byproducts on the cathode that result from lithium ions combining with carbon dioxide and water vapor in the air. These byproducts gum up the cathode, which eventually becomes completely coated and unable to function. These experimental batteries have relied on tanks of pure oxygen — which limits their practicality and poses serious safety risks due to the flammability of oxygen. For this work, the researchers used a unique combination of anode, cathode and electrolyte materials to prevent anode oxidation and buildup of battery-killing byproducts on the cathode and allow the battery to operate in a natural-air environment. 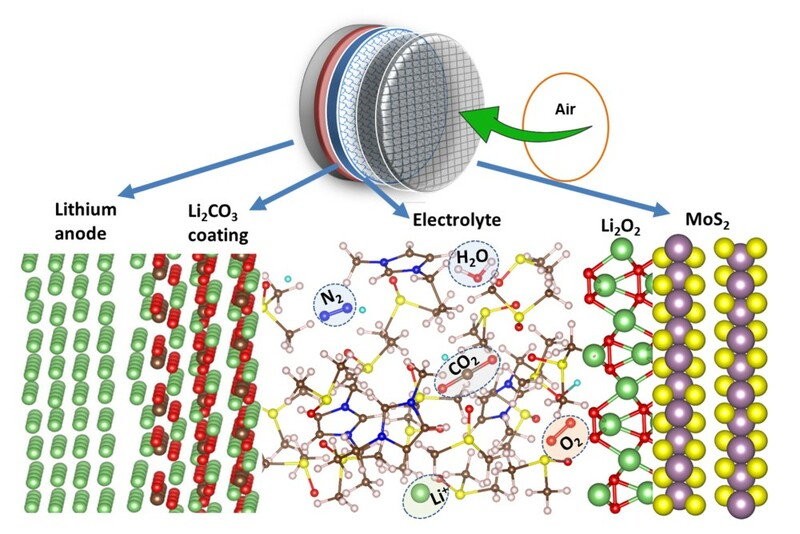 The team also coated the lattice structure with a molybdenum disulfate catalyst and used a unique hybrid electrolyte made of ionic liquid and dimethyl sulfoxide, a common component of battery electrolytes, that helped facilitate lithium-oxygen reactions, minimize lithium reactions with other elements in the air and boost efficiency of the battery. “The complete architectural overhaul we performed on this battery by redesigning every part of it, helped us enable the reactions we wanted to occur and prevent or block those that would ultimately cause the battery to go dead,” said Amin Salehi-Khojin, assistant professor of mechanical and industrial engineering at UIC. 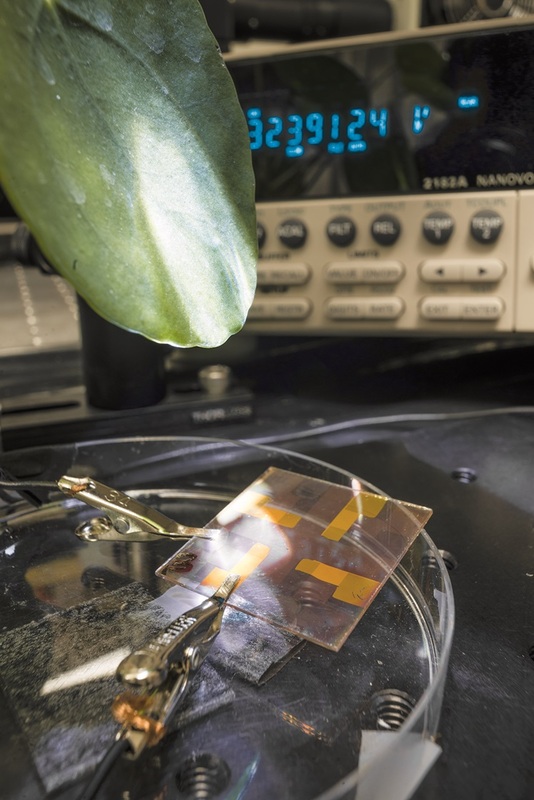 Researchers at Linköping University developed a material that generated an electrical impulse when the light fluctuates from sunshine to shade and vice versa, inspired by the fluttering of leaves in the wind. Previously, the team developed small nanoantennas that absorb sunlight and generate heat that, when incorporated into window glass, could reduce cold downdraughts and save energy. The antennas, with dimensions in the order of tens of nanometers, react to near infrared light and generate heat. Now, the team created a tiny optical generator by combining the nanoantennas with a pyroelectric film. In pyroelectric materials, an electrical voltage develops across the material when it is heated or cooled. The change of temperature causes charges to move and the generation of an electric current in the circuit. “The nanoantennas can be manufactured across large areas, with billions of the small discs uniformly distributed over the surface. The spacing between discs in our case is approximately 0.3 micrometers. We have used gold and silver, but they can also be manufactured from aluminium or copper,” said Magnus Jonsson, docent and principal investigator for the research group in organic photonics and nano-optics at the Laboratory of Organic Electronics, Linköping University. The antennas generate heat that is then converted to electricity with the aid of the polymer. It is first necessary to polarize the polymer film in order to create a dipole across it, with a clear difference between positive and negative charge. The degree of polarization affects the magnitude of the generated power, while the thickness of the polymer film seems not to have any effect at all. To demonstrate the effect, the team placed a twig with leaves in the air flow from a fan. The motion of the leaves created sunshine and shade on the optical generator, which in turn produced small electrical pulses and powered an external circuit. “The research is at an early stage, but we may in the future be able to use the natural fluctuations between sunshine and shade in trees to harvest energy,” said Jonsson. More immediate applications of the technique might be in optics research, such as the detection of light at the nanometer scale, or optical computing. Researchers at Chalmers University of Technology developed a fabric that converts kinetic energy into electric power. The greater the load applied to the textile and the wetter it becomes the more electricity it generates. To create the textile, the researchers wove a piezoelectric yarn together with an electrically conducting yarn. The fabric can currently generate enough power to light an LED, send wireless signals or drive small electric units such as a pocket calculator or a digital watch. The piezoelectric yarn is made up of twenty-four fibers, each as thin as a strand of hair. When the fibers are sufficiently moist they become enclosed in liquid and the yarn becomes more efficient, since this improves the electrical contact between the fibers. In principle, the technology is ready for larger scale production, according to the researchers. The cost of the material is relatively low, comparable with the price of Gore-Tex, and can be woven in industrial looms and is sufficiently wear-resistant to cope with the harsh conditions of mass production.